Efficient and selfless persons while propagating certain cause, develop institutions which imparts valuable training to the youth of the country and make those institutions immortal. Gajanan Yashwant Manik or well known as Rajratna , Rajpriya, Professor Manikrao of Baroda, is one such personality who devoted his entire life towards building physical fitness of the youth through his innovative and revolutionary approaches. 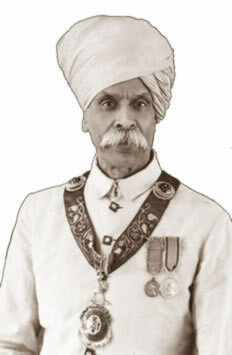 He was the first to call Akhada (gymnasium) a "Vyayam Mandir" which means "A Temple of Physical Education". Professor Manikrao, a person with great virtues, was a renowned wrestler, highly skilled martial art exponent, a Unani Hakīm, a Vaidya, par excellence in art of bone-setting, a pharmacist, a social worker, social reformer, a gem in the court of Baroda ruler Mahajraja Sayaji Rao Gaekwad and, a highly patriotic personality. Professor Manikrao, a great visionary, and through his unique ideology, eminence, assertiveness and proficiency in combat art became a role model to thousands of youth in India. This website is an attempt to provide a true tribute and honor to this polymath.